This is kind of a fun day for me. One of my favorite bloggers Shannon from luvinthemommyhood invited me to be part of her Babyhood Bonanza. If you haven't gone over for a visit you must go check out all of the great tutorials. Great for you if you are expecting or have a new little one and also great gift ideas! If you are new to Lily&Thistle, I welcome you. I hope you will feel free to have a look around follow along if you'd like. OK, on to the tutorial. Today I'll show you how to take an inexpensive thrift store picture frame and turn it into something beautiful for your nursery or little ones' bedroom. Also, I'm offering the print pictured for free...just scroll down to download it and print it out! Go to your local thrift store (or your garage) and find a frame (I found a frame and a mat). You can usually find a pretty good quality frame for around two dollars. My mat was a little large for my frame so I simply traced the back insert and cut my mat to fit. Enjoy the magic and wonder of spray paint and paint both the frame and mat. A whole new frame...almost. 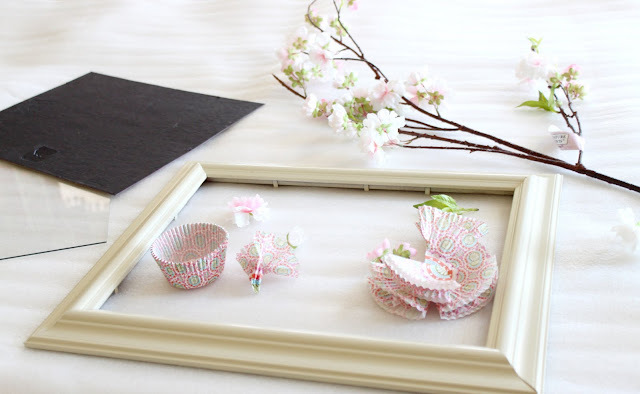 We'll be needing those cupcake papers soon...you'll see...and the cherry blossoms. 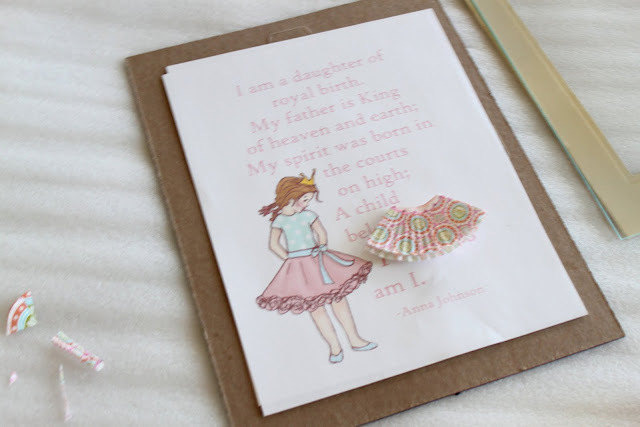 If you choose to go with the print I'm offering below, you can embellish it a bit using those cupcake papers. Just fold your cupcake paper into thirds and cut the top off....ta da! you now have a really cute skirt! Now you can use some inexpensive acrylic paint (you know the kind in the 98 cent bottles at Walmart?) and paint your mat the color you'd like...mine was robin egg blue. Here's a close up of the new textured skirt...I just used glue dots to adhere it. After you put everything together, get your trusty hot glue gun out (or your glue of choice) and then adhere a branch or two (or whatever decoration you'd like) to your frame....almost done. On the back of your frame (if you'd like it to hang from a ribbon) just use thumb tacks and tack it to the back on both sides. A word about the print: I have always loved this particular adaptation from this poem. In fact as a young girl, I made a special frame for it at our church's girls camp. As a mother of three girls, princesses will probably be a big part of life. 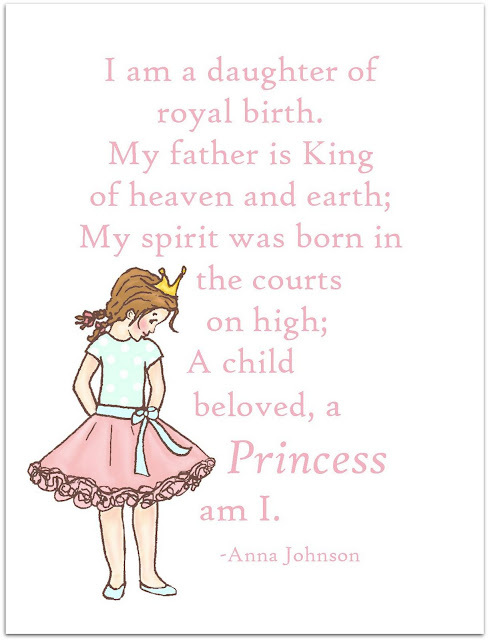 I want my girls to remember and to know that they truly are and always will be princesses in a very real way. I think this poem expresses that perfectly. I hope you will enjoy (also, if you'd like the hair and skin personalized in this picture, let me know and I'll change them for you for a small fee). LOVE it, Hannah. Thanks for the PDF. Hugs to you and your dollies. I love it too, Hannah! The frame turned out so cute! what a beauty! Thanks for your generosity! I just came over from luvinthemommyhood. I loved reading about how you got your girls and it made me cry (I'm pregnant right now and everything makes me cry) especially because one of your little twins has my name! 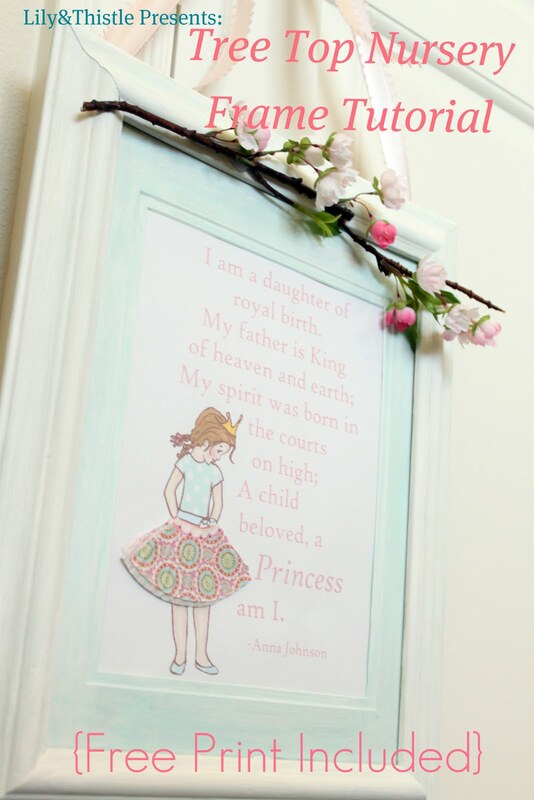 I love your printable and I definitely want to do this for my daughter's room, although instead of a branch I will do butterflies because she has a butterfly room. That's such a great mix of vintage/chic...it's adorable. I never thought about cupcake papers as skirts. WOW. Genius! It means so much to me to see what all of you are doing with it. Thanks Missy for taking the time to let me know! i love this. adore this. treasure this. going to print this and put into my little girlies room!!! thanks soooooooo much!!!!!!!!!!!!!!!!!!!! I made one of these for a gift tonight... when it is finished I am going to send you a picture. I LOVE IT! I plan on making one for my own girls very, very soon! THANK YOU!!!! Hey I posted today on how mine turned out. I LOVE it. so so so so cute and special and sweet. I tried e-mail you at your gmail account but it came back... I might have put it in wrong bc I was in a hurry. found this on Pinterest, can't even tell you how much I love it! Thank you so much! I'm making one for my daughter's room right now! Where did you get the adorable cupcake papers? I can't find anything other than solids at our grocery stores here in town. I printed this off for my daughter and now my boys want to know, where's the boy one. Ha ha ha ha ha. This is going to make a fabulous birthday present for a friend's daughter. Tahnk you. Hi. Do you know where I can possibly find this print with an African American little girl? Any info you can give me will be great! This is darling!! Thank you, my DD will love it in her new room. What a beautiful poem! Every little girl should have this in their room, pinning it for later! Thanks! Love this printable. I pinned it off something someone else pinned and I was so sad I couldn't find the source. After about 30 minutes of google I finally found it on someone else's pinterest, haha. 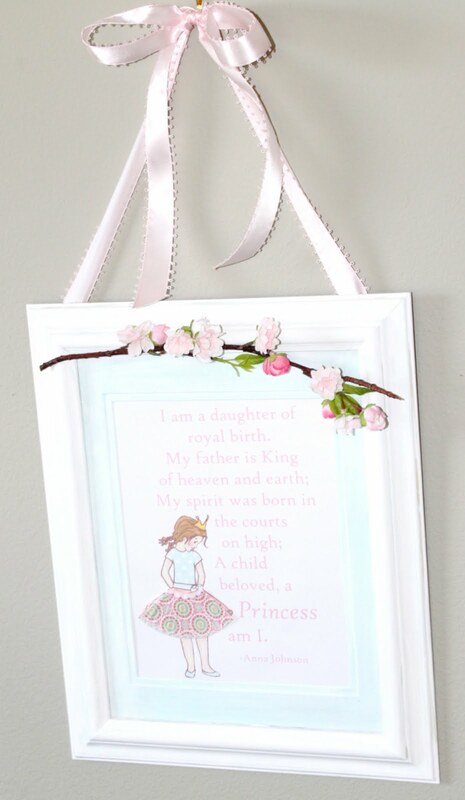 Thank you so much for sharing it, it is the inspiration piece for my daughters nursery! I love this print! Any chance that you could make an Asian version of the girl? I am decorating my girls' room and would love to incorporate this! Thank you! I absolutely LOVE LOVE LOVE this!!! Is there a boy one? I found this last night, on the eve of teaching a Primary lesson that has this very poem in it! My class is made up of all girls, so I am excited to print these out and give them one today. I would love one for boys, too, as I gave birth to five ;)Thank you so much for sharing your talent--you've made my job a little easier! Hi! I wanted to stop by and say thank you for making such a beautiful print out. I actually used it on my blog today. I gave you the credit, of course, but I still wanted to let you know. If you don't want it there, please tell me and I can remove it.